Since Windows Internet Explorer 9 is still in Beta period, Microsoft Windows users who have already installed Internet Explorer 9 Beta on their Windows 7 or Windows Server 2008 (or Windows Server 2008 R2) computers might want to uninstall Internet Explorer 9. Probably removing IE 9, Windows users prefer to use IE8 or IE7 again as they upgrade to IE9. If you also want to remove Internet Explorer 9 from your Windows 7 PC or Windows Server 2008 computer, here you will find how to uninstall Internet Explorer 9 step by step. If you are looking for Windows Internet Explorer 9 downloads, please refer to IE guide Windows Internet Explorer 9 - IE9 Download Links and IE9 Installation. Although Windows Internet Explorer 9 Beta has been successfull on many installation on Windows 7 PCs, some users indicate problems on their computers related with IE9. If you have such Internet Explorer 9 problems and experience unwanted situations or bugs, you can easily uninstall IE9 by following the listed steps. Unfortunately, there is not an IE9 removal tool that will uninstall IE9 with one click, but IE9removal is still very easy. IE9 removal will automatically restore the previous version of Internet Explorer on Windows users computers. First action you will take in order to remove Internet Explorer 9 is to open the Control Panel. Using the Control Panel options, click on the Programs option. This will lead you to actions you can take on installed programs or Windows features on your Windows 7 PC. Click on the Programs and Features short-cut link on the Programs Control Panel option. The new displayed screen has a title "Uninstall or change a program". Note that you will not be able to see Internet Explorer 9 listed on the list here on this screen. 4. Click View installed updates on the left pane. On the left hand side of the screen, you will see the "Vies installed updates" link. Click on the link to display the program updates and to uninstall any update including Internet Explorer 9. 5. Scroll down until you Microsoft Windows updates are listed. Among Microsoft Windows updates, you will see Windows Internet Explorer 9. 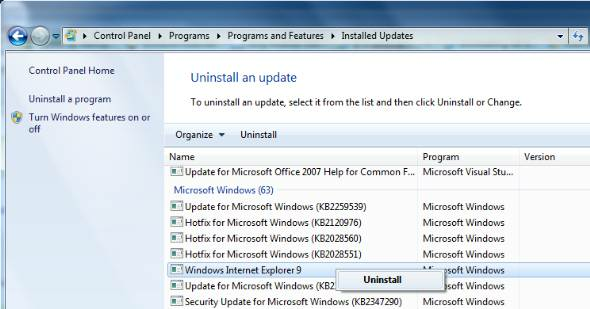 To remove Internet Explorer 9 (IE9), right-click on the item and choose Uninstall. This selection will start the Windows Internet Explorer 9 removal procedure. After the uninstall of IE 9 Update is completed, Windows 7 will return to use Internet Explorer version which was previously installed on your computer. The previously installed web browser version may be IE7 or IE8, but just before the IE9 Beta 1 update was done. I know that some Windows users are expecting an IE9 Removal Tool for Internet Explorer 9 Beta from Microsoft, since Windows updates sometimes may cause problems during uninstallation of Windows components. Perhaps an Internet Explorer 9 Beta Uninstallation tool will solve all possible uninstall problems that may arise because of Windows updates.